The ingredients’ synergy of Viazen Stress is the key of the effectiveness of this SUPERIOR FORMULA. 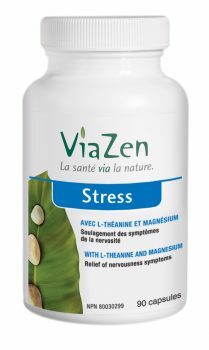 Viazen Stress offers an efficient « ANTI-STRESS » solution to anybody undergoing a daily stress and who is affected by discomforts which result from it. This plant “adaptogen” deactivates the disproportionate stress response of the body. By its many therapeutic actions: anxiolytic, sedative, hypotensive, immunomodulant, anti-inflammatory and antioxidant, it helps optimizing the physiologic adaptation. It will generate sedative and hypnotic effects, associated with an improvement of the drowsiness and quality of the sleep. As a resultant, a deep and refreshing sleep and a reduction of anxiety. Because of its spasmolytic properties, it contributes to stop the nervous tensions. This amino acid extracted from green tea contributes to increase dopamine, serotonin and GABA’s production at the cerebral level. These three neurotransmitters are respectively associated to wellbeing, mood modulation and anxiolytic sensation. It also supports the production of the alpha cerebral waves, which are responsible for a relaxation state and a reduction of the anxiety. It generates calming and alkalizing effects and a relaxation state at the muscular level. It also supports the nervous and the adrenal glands functions, as well as the activation of several enzymes implicated in the physiological reactions of acute and chronic stress. By taking part in carbohydrates, lipids and proteins metabolism, it will optimize the energy production. * Daily dosage corresponding to 3 capsules of Viazen Stress. Microcrystalline cellulose, vegetable magnesium stearate, gelatine. Viazen Stress is free of wheat, soya, corn, yeast, peanut, gluten, egg and dairy products. It does not contain preservatives, sweeteners, colouring agents, artificial flavours and is exempt of GMO. Viazen Stress will be taken on a regular basis at the daily dosage of 1 capsule 3 times a day with food, during the entire stress period. The benefits will appear after a few days, but the optimal results will be observable after about three weeks of treatment. When used on a long period, Viazen Stress will contribute to reduce the risk of developing health disorders having the chronic stress as causal agent. Consumption of this product with alcohol, other medications or natural health products with sedative properties is not recommended. Consult a health care practitioner if symptoms persist or worsen or prior to use if you are pregnant or breastfeeding. An optimal physiological and psychological health condition is associated with a good stress management. It is possible to learn having better stress reaction and transforming it into motivation and stimulation elements! Stress syndrome includes a set of physiological and psychological reactions appearing when the organism must adapt to a specific situation. In certain occasions, stress reactions are normal and useful. It is good stress. As example, the academic performances will be increased in the presence of a certain stress level, by stimulating alertness and concentration. This good stress supports then performances. At the opposite, if the stress level is disproportionate during a specific situation, it will become a bad stress. A continuous stressful situation, which is impossible to manage or avoid, gives place to a chronic stress, which will have bad effects on the health condition of an individual. People affected by chronic stress are generally unaware of what is going on. As examples, the traffic jam on the road, the lack of sleep, an irregular and incomplete food supply or an immoderate coffee drinking are often generating bad stress and chronic stress. On physiological level, homeostasis (state of balance) mechanisms are very often requested in the presence of stress. The autonomic nervous system (our automatic pilot of several physiological functions) is continuously dealing with stress. The sympathetic nerve way prevails on the parasympathetics one. Blood flow is principally conveyed towards the brain and the muscles. Digestive and elimination processes become secondary. Regarding the endocrinal system, adrenal glands are continuously requested. They secrete hormones including adrenalin, noradrenalin and cortisol. These hormones will increase the blood pressure, will generate cardiac rhythm and breathing rate and will raise the blood glucose level. These adaptation reactions permit to provide sufficient and constant energy to muscles and brain for effectively fight or avoid the stress source. If the stress becomes disproportionate or chronic, if it is spread over a sustained period, the organism becomes exhausted. Adrenal hormonal secretions become insufficient and the organism is unable compensating for this energy expenditure. It is at this moment that emerges a greater vulnerability to different modern society discomforts and diseases: burn out, cardiovascular and immune diseases, type 2 diabetes, cancer, etc. Stress factors are numerous and belong to our everyday life habits. Accelerated life rhythm, competition, denatured environment and excessive psychic stimulation will exacerbate them. Among these many factors of stress, there is the inadequate nutrition (refined, proceed and incomplete foods); digestive functions disturbances, (heartburn, constipation, diarrhea, gas, etc. ); oxidative stress (free radical excesses compared to antioxidants); infectious agents (bacteria, virus, yeast, parasites); physical trauma (accident, surgery, chronic pain); environment pollutants exposure (pesticides, weed killers, industrial products, paintings, solvents, car gas exhaust, radiations) and heavy metals. Also, drugs intake, emotional and circadian rhythm disturbances as well as insufficient physical activity are important factors of stress. 1. Nedd K. Power over stress. QP Press. 2003. 207 pages. 2. Gagnon R. La Nutrithérapie. Collection Douce Alternative, Amyris. 2004. 287 pages. 3. Marieb E. Anatomie et physiologie humaines. ERPI.1993. 1013 pages. 5. Delarie J. et al. Fish oil prevents the adrenal activation elicited by mental stress in healthy men, Diabetes & Metabolism. Vol 29(3). Juin 2003. pp.289-295. 7. The Doctors’Prescription for Healthy Living. The Damaging Effects of Stress on Your Health. Volume 7(11). pp.2-4. 8. L-Théanine. Alternative Medicine Review. 2005. Vol 10(2). 136-38. 9. Kimura K et al. L-Theanine reduces psychological and physiological stress responses. Biol Psychol. 2007 Jan;74(1): 39-45. 10. Pharmacology and therapeutic uses of theanine. Am J Health-Syst Pharm. 2006; 63(1): 26-30. 11. Lu K et al. The acute effects of L-theanine in comparison with alprazolam on anticipatory anxiety in humans. Hum Psychopharmacol. 2004 Oct;19(7):457-65.